As regular readers know, I am a big fan of the Maggy Hawk Vineyard Anderson Valley Pinot Noirs crafted by Elizabeth Grant-Douglas. She found time to give me a tour of the picturesque vineyard on a rainy Saturday morning before the Anderson Valley Pinot Noir Festival held at Goldeneye Winery in Philo. 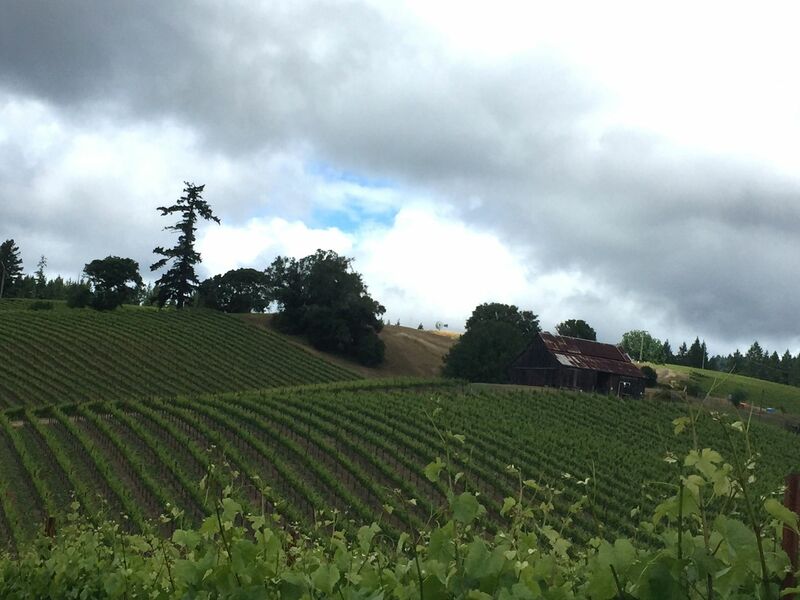 Elizabeth calls this vineyard her “favorite place on earth” so I was eager to see it. Elizabeth traversed the muddy, bumpy and slippery slopes in the vineyard with expertise as I gazed about in wondrous amazement at the peaceful beauty of the vineyard. I have seen thousands of vineyards in my wine writing career, but there are very few that illicit such a response from me. Elizabeth’s single catchword for the vineyard, “Heavenly,” is the most apropos description. The photo below does not do it justice, as the rain made it challenging to photograph. This 58.7-acre property is hidden away a short distance west of the Rock Shop on Highway 128 in the deepest end of the Anderson Valley, this consists of multiple vineyards with varying aspects and slopes surrounded by densely wooded coastal redwoods. Fog-cloaked and wind-swept, the vines struggle throughout the growing season, ripening very slowly with yields typical less than two tons per acre. 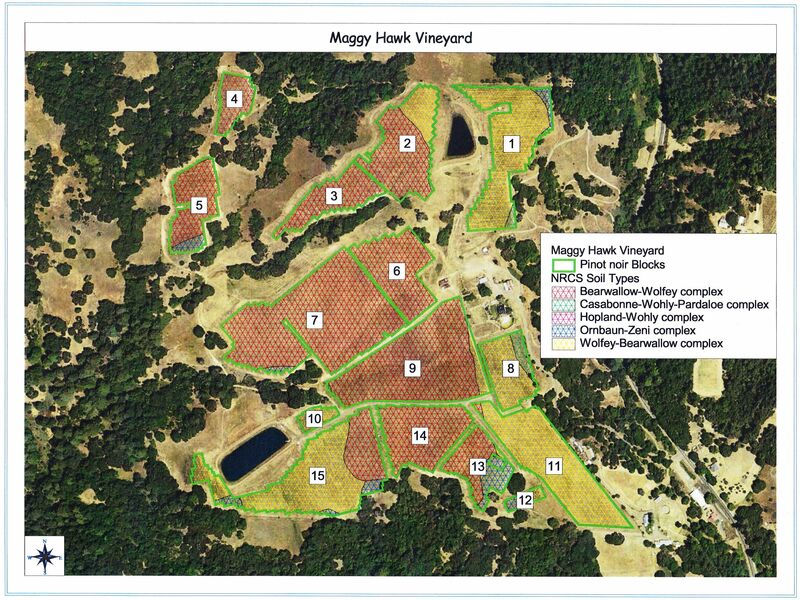 The Maggy Hawk Vineyard, named after owner Barbara Banke’s favorite thoroughbred horse, was planted in 2000 to 23.55 acres of varying distinct blocks and a variety of clones including Pommard 5, Wädenswil 2A, and Dijon 115, 667 and 777. The wines under the Maggy Hawk label first appeared in 2007 (before that, the grapes were a component of the La Crema Anderson Valley bottling beginning in 2003). After tasting the first vintage I said, “The Maggy Hawk Pinot Noirs are vinous treasures of uncommon pedigree much like their namesakes. They are truly special connoisseurs' wines that possess a somewhereness that sets them apart.” My opinion has not changed, having sampled wines from all seven vintages released to date. Of the 27 Maggy Hawk Anderson Valley Pinot Noirs reviewed to date, nine have been given the Pinot Geek designation with scores of 94 or above. Every wine has received at least a score of 90. Now that I have visited the vineyard, the wines will become even more vivid in my mind. 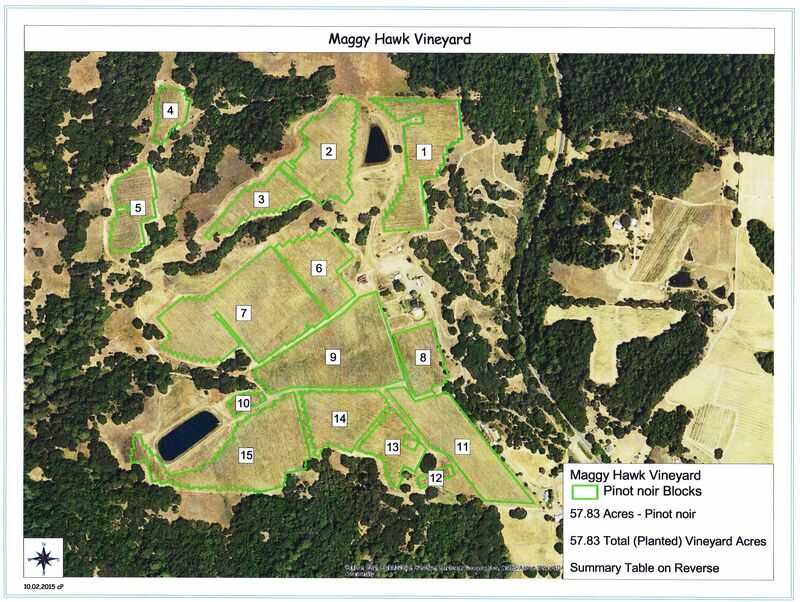 The Maggy Hawk wines are made from single clones from a specific block within the vineyard and each bottling is named after a horse born to the mare Maggy Hawk: Jolie, Afleet, Stormin’, Unforegttable and Hawkster. Last night (July 5, 2016) I popped the cork on the 2012 Maggy Hawk Hawkster which is made from a single 6.18-acre Wädenswil 2A planting (Block 13). The wine was aged 16 months in 100% French oak barrels, 63% new. I first reviewed the wine when it was young (score 93), then again in November 2015 wine I remarked, “A wine that brings emotion,” score 97. The wine is exquisite now with glorious dark fruit, refined tannins and a finish that is both explosive and persistent. It is drinking now at or close to its apogee, score 97. 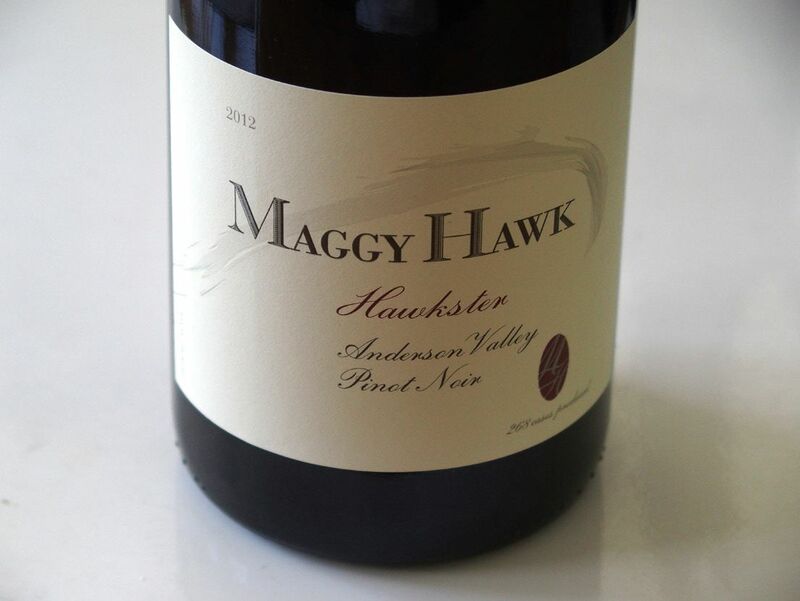 Hawkster is only produced in the best vintages and is considered the crown jewel of the Maggy Hawk collection. Maggy Hawk wines are sold through a mailing list at www.maggyhawk.com. I can highly recommend you saddle up.